If you believe the screaming headlines and cheerfully grim morning talk show hosts, this year’s flu is overwhelming ERs and worrying public health experts sick. The record-breaking virus is spreading like wildfire, projected to be the worst strain in history. It’s even hitting our national treasures. But for New Yorker Khalil Ali, H3N2 is no sweat. I'm among those who can't get the flu shot. The things I’d survived by Ali’s age make us incompatible, this vaccine and I, and his bold refusal to take it made me both jealous and oddly relieved. I'd spent the last few hours feeling less than awesome. Plus, the news was kinda freaking me out. Forget it, Ali assured me. Never mind all the sick people stripping this aisle as fast as he filled it, the coughing, sneezing, red-eyed masses on the morning train from his home in Astoria or the masked classmates at his high school in Long Island City -- the virus that has sent thousands of New Yorkers to the hospital and killed two children since January 1 is no match for his mom’s cooking. Eating? I hadn't done that all day. It hadn't even occurred to me. Have you ever felt, like, unsure if you are coming down with the flu or just kind of stressed out? I texted a friend. "Crack is easier to get than Tamiflu." Uhhhh not for long, she replied. The correct answer unfurls rather quickly. Rather quickly, I had a fever of 102. “This year is a nasty year,” said Dr. Arthur Caplan, the Director of Medical Ethics at New York University’s Langone Medical Center and an outspoken booster of the flu vaccine. Whereas some influenzas are hard to catch, H3N2 is "easier to transmit and it’s more aggressive, so it makes you sicker,” he explained. To make matters worse, “the match between the flu vaccine and this circulating nasty strain of the flu is not great,” Caplan said, making it far less protective than most years. That doesn’t mean New Yorkers shouldn’t get it, the expert emphasized. “Twenty or thirty percent protection is better than zero,” and there’s evidence to suggest those who are inoculated suffer less when they do get infected. Bronx mom Shanna Jervis is still kicking herself that she put off her kids’ shots. “Every year I’ve gotten them the flu shot, they’ve never gotten sick like this,” she said of her 7-year-old twins, Zoe and Jude, who have each spent a week out of school with the flu and strep throat. The moment her son spiked a fever, “I told them to separate, don’t talk to each other, don’t look at each other.” Yet, within hours of taking her son to be seen, she was trekking back to the clinic with her daughter. Jervis has multiple sclerosis, a disease that makes her especially vulnerable to complications from influenza. She and her children were prescribed oseltamivir (the generic name for Tamiflu), an antiviral that can make flu symptoms less severe. But doctors warn that the drugs only work when taken early -- generally within the first 48 hours -- and in her neighborhood, at least, they were on back order for a week or more. When she finally found some at a Rite Aid, the pharmacy chain explained they no longer took her children’s insurance, demanding $300 out of pocket per course. I would drink mentholated topical ointment and soak my feet in chicken stock if science said it would make me feel better. Like Jervis, I am also a high risk patient -- pneumonia and I have been best friends since grade school -- but unlike her, my Tamiflu journey was simple. I walked into my nearest storefront urgent care, forked over the $75 copay and was attended by three physicians assistants who cheerfully tried to upsell me on an EKG and a chest x-ray before prescribing oseltamivir to my usual Brooklyn pharmacy where it cost the usual $10. The relief was quick and dramatic, roughly comparable to what you'd get with a Z-Pak for pneumonia, or Pedialyte for a hangover. Not cured by any means, but significantly better. The real challenge was how to keep from spreading it to my 2-year-old, with whom I was alone. Don't kiss him on the face, my aunt texted helpfully. 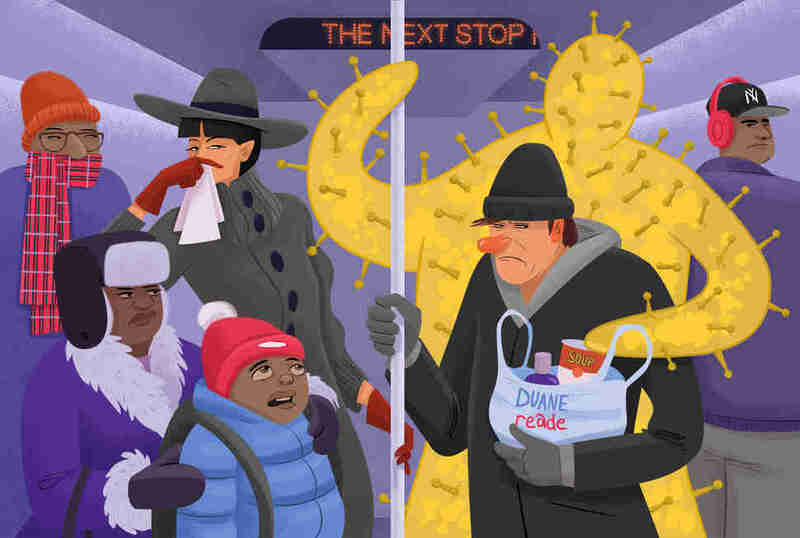 Jervis said she was told to wear a surgical mask around her sick children, something health-minded straphangers may be tempted to do. But Dr. Caplan said simple surgical masks aren’t effective against viruses, and that the ones that might help are expensive for everyday use. Besides, the subway isn’t nearly as germy as everybody thinks it is. Not even sick people stay home in New York. Especially not sick people. 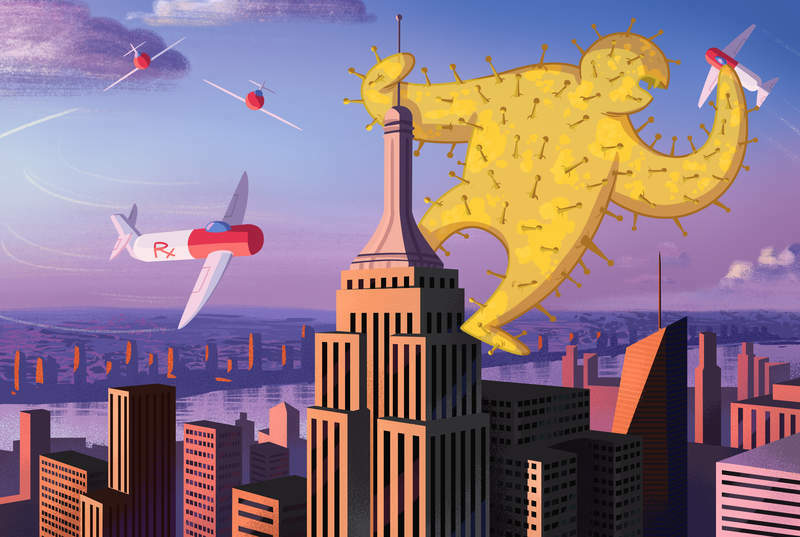 The Upper West Side resident said she had the flu shot and was militant with Prell and Lysol. Still, when the fever hit her, it hit hard. For days, she languished in a humidifier haze of Netflix and chills. “I did the super New York thing of getting a bunch of bone broth,” she added. Like Ali, Hohenberger reps chicken broth for what ails you. I still felt like trash, but more like kitchen trash, not like hot summer trash or the first trash pick-up after a blizzard. All right, I thought on Day 2, I've got lymph nodes like avocado pits and angry tonsils, I'm wearing my puffer coat under the covers and aching in unfamiliar joints the way Barre makes me hurt in tiny, disused muscles. I would drink mentholated topical ointment and soak my feet in chicken stock if science said it would make me feel better. “Both are useless,” Dr. Caplan emailed me. “The best thing people can do to protect themselves and their family is to get a flu shot now if they are not already vaccinated,” a spokesman for the city’s department of health wrote in an email. If, like Jervis, you’re at high risk of developing flu complications, state health officials recommend you seek out antivirals as soon as you have symptoms. In my case, they helped a lot. I still felt like trash, but more like kitchen trash, not like hot summer trash or the first trash pick-up after a blizzard. It was tough to get out of bed, but I could drag to the couch to watch Sesame Street with my kid and answer the front door for sushi. (Yes I ordered sushi for a 2-year-old, don't @ me). “If you see someone who’s not moving, who can’t really get up to go to the bathroom,” that person needs urgent medical attention, Caplan said. For the rest of us, the advice is as humdrum as a sick day. Wash your hands more. Touch your face less. Hydrate, rest, stay home if you’re sick. And don’t kiss your children. Thanks to his vaccine, my own little germ ninja is still flu-free. And even without the shot, it looks like I’ll live to remedy another day. Sonja Sharp is a writer in Brooklyn and an instructor at the Columbia University Graduate School of Journalism who enjoys reporting on murders and wearing all the fur.